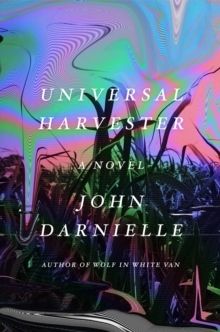 Universal Harvester is the second novel from John Darnielle, the leading (and often sole) member of The Mountain Goats and one of my all-time favourite songwriters. I previously reviewed his first book, Wolf In White Van, and Universal Harvester once again has many themes that people familiar with Darnielle's music will recognise. Set in the small towns of America's Mid West, Universal Harvester begins in a video rental shop some time around the start of this century, when customers begin to return tapes complaining that there is 'something else' on them. When shop assistant Jeremy and his boss start to watch the tapes, they discover that the footage consists of grainy home video scenes that they both find frightening, yet strangely compelling. Who filmed the footage, and why are they splicing it into rented movies? This isn't, however, the horror story you might expect, and neither is it a mystery novel. It's a contemplative, often poetic book about lost mothers, small towns, displacement, landscape and the gradual decline of America's farming communities. The endless corn fields of Iowa and Nebraska are beautiful, but Darnielle shows us that their uniformity and scale can be disorientating too, almost threatening. Jeremy's teenage colleague Ezra, a farmer's son deeply ingrained with the notion that you shouldn't get into debt or throw away anything you might be able to use, risks his life on a daily basis by driving his dangerously clapped-out car along a gravel track for half a mile before he even reaches the highway, just to get to his minimum-wage job in the video store. Fundamentalist Christian doomsday cults hand out ominous tracts to the vulnerable in town centres while their members scavenge in rubbish bins. Jeremy and his father live quietly together in apparent harmony, yet there's an ever-present loneliness in each of their lives following the death of Jeremy's mother some years before, and there is much that goes unsaid between them. Another character's life is entirely shaped by the disappearance of her mother in the 1970s. Later, in the present day, a pair of empty-nesters buy a rundown farmhouse as a retirement project and have to learn to find new ways of being a family when their grown-up children come to visit them from their colleges at opposite corners of the country. The ostensible connection between the characters is, of course, the footage spliced in the video tapes, but while we do learn where it came from, there are still plenty of questions left unanswered; this isn't a plot-driven novel. There's a strong sense of melancholy that's present throughout the story, although there is plenty of hope too; it's bittersweet rather than dark, despite occasional hints at goings-on more sinister than the ones that are actually described to us. Structurally, Universal Harvester is a surprisingly digressive and complex novel for one so short, shifting between different characters and time periods. Darnielle also uses an interesting technique where the narrator occasionally intervenes in the story, reminding us of its fictionality - telling us, for example, that there are other versions of this story where things happen differently. The first incidence of this pulls the rug from under the reader's feet somewhat, coming out of the blue and telling us, just as we'd settled in to the rhythm of the story, that this might not be quite the book we thought it would be. It won't come as a surprise to anyone familiar with Darnielle's songs that Universal Harvester is a beautifully written novel. The prose throughout is lyrical, haunting and memorable: it's the sort of book where I found myself wanting to underline my favourite passages. This is a book that, inevitably, won't be everyone's cup of tea, but I loved it more than any book I've read in a long time, and I know it will be an enduring favourite for years to come.